Whether you like to keep tabs on famous sapphire rings, are interested in a diamond engagement ring with sapphire accents, or are looking for a full-on sapphire vintage engagement ring, you’re certainly not alone. To help you learn more about this singular stone, we put together a few key facts about the sapphire. 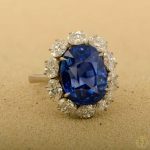 We have compiled a list of where to find sapphires, common colors and cuts for jewelry, and a list of the five most famous sapphires known today. 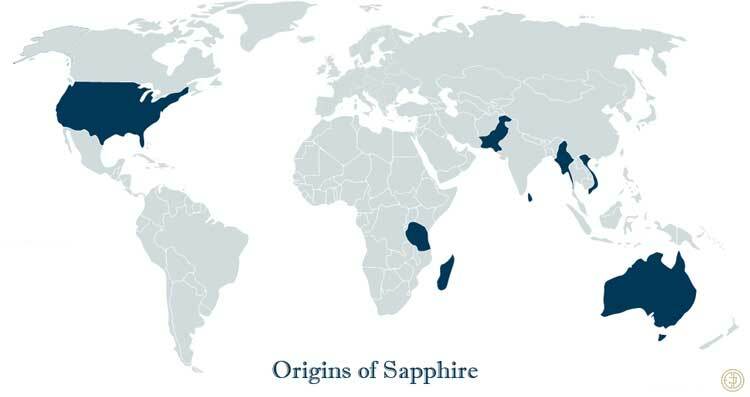 Sapphires come from Sri Lanka, Kashmir, and Myanmar. They also come from Australia, Thailand, Vietnam, and Montana. Antique sapphires are more likely to have come from Cambodia, Kashmir, Burma, or Ceylon in Sri Lanka. Madagascar has also recently become commercially involved in the sapphire trade. An engagement ring with sapphire, or any other piece of sapphire jewelry, can be tested by organizations such as Gubelin, GIA, and SSEF to determine the stone’s country of origin. The blue sapphire is a natural gemstone found in the ground, and comes from the element corundum. Trace amounts of other elements like iron, titanium, chromium, copper, or magnesium can create blue, yellow, purple, orange or green colors in the stone. Although a hard and durable stone, sapphires can be cut into almost any shape. The most popular cuts for an engagement ring with sapphire include Cushion cut, Emerald cut, and Round cut. However, non-faceted sapphires are also popular. Interestingly, while inclusions in other forms can detract from the value of a stone, a star shaped inclusion can actually add to the value of a sapphire. In order to help deepen the color and increase the final carat weight, sapphires are often cut into long pavilions. Sapphires have held historically prominent roles since the beginning of jewelry history. The sapphire engagement ring given by Prince Charles to Princess Diana is one of the most famous rings in history. Prince William eventually gave it to Kate Middleton. The Star of India. This 563.35-carat sapphire, mined in Sri Lanka has almost no inclusions. It is also famous for it’s distinctly grayish blue color. The sapphire was stolen in 1964. Luckily, a year later it was recovered. It now sits at the American Museum of Natural History in New York City. Maria Alexandrovna Sapphire Brooch. This is a 260.37-carat sapphire recognized worldwide for its size, color, and clarity. The stone was procured by the Russian Emperor Alexander II for his beloved wife, Empress Maria Alexandrovna. It is now housed in Moscow’s Russian Diamond Fund. The brooch was honored by the USSR in 1971 by being placed on a postage stamp. The Stuart Sapphire in the Imperial Crown. Originally owned by King Alexander II of Scotland, this oval sapphire is part of the British Crown Jewels. The sapphire carries the name of the Scottish House of Stewart. Black Star of Queensland. This 733-carat behemoth is the world’s largest gem quality star sapphire. Ironically, a jeweler discovered it after sitting at the backdoor for 10 years. Rockefeller Sapphire. This 62.02-carat Burma sapphire is set in a Tiffany and Co. mounting and is the world’s most renowned engagement ring with sapphire. It is the benchmark by which all jewelers measure Burmese sapphires. If you are interested in an engagement ring with sapphire, either as a center stone or in a halo or accent, reach out to the EDJ team and we will help you make an informed decision.